Many people assume that all members of the Russell 3000 are “safe”. I didn’t fully believe him because all the stocks were drawn from a list of the 3000 largest publicly traded companies in the US, the Russell 3000. But indeed, most of the stocks the strategy liked were priced below $5.00 and were thinly traded. We discovered, later, while executing another strategy that even small trades in this group suffered significant slippage (the difference between the price you expect and the price you get). My students, colleagues and I have (re) discovered this a number of times: There are inefficiencies in thinly traded stocks, and machine learning approaches will discover them. The reason the inefficiencies remain there is because large hedge funds and investment banks don’t trade them. If they did, these inefficiencies would disappear. Imagine that you’re managing a $5B fund. In order for a strategy to work for you, you need to be able to invest tens of millions of dollars at a time. It’s hard to buy $10M of a $5M company! Perhaps these strategies can still be exploited by the “little guy.” But in my experience, the act of trading a small stock often affects the price more than you were hoping to make on it in the first place. Here’s an example: Suppose you discover a strategy in back testing that, on average, yields 0.25%, or 25 basis points per play. That might not sound like much, but if you can gain that return reliably and you’re trading 100s of positions weekly or daily, it adds up nicely. Now, if you’re trading stocks in the S&P 500, you can expect that by trading you will affect the price only a small amount, say 5 bps. This is the “slippage” component of transaction costs. In this case slippage adds up to 10 bps per play: 5 bps to enter, 5bps to exit, leaving you a 15 bps profit on each trade. But if you’re trading down in the bottom of the Russell 3000, slippage is more likely to be 20 bps than 5 bps, and your gain is wiped out. By the way, slippage isn’t the only reason to stay out of the weeds. Commissions turn out to be relatively higher for cheap stocks as well. What we’re saying above, essentially, is that illiquid stocks affect a trading strategy negatively because transaction costs are higher. 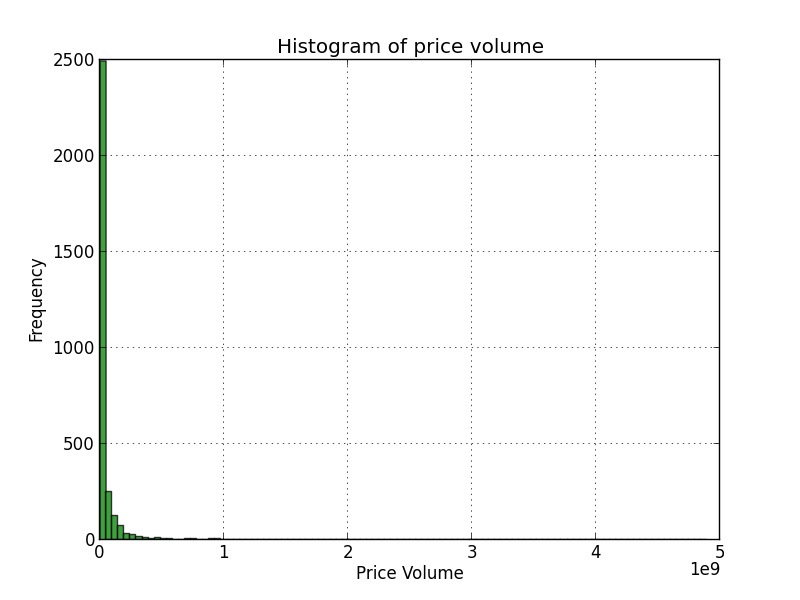 Price * volume is a great measure of liquidity because it tells you how many dollars trade in a stock each day. At Lucena we use a 30 day average of price * volume. We usually stay away from stocks with an average below $1M/day. 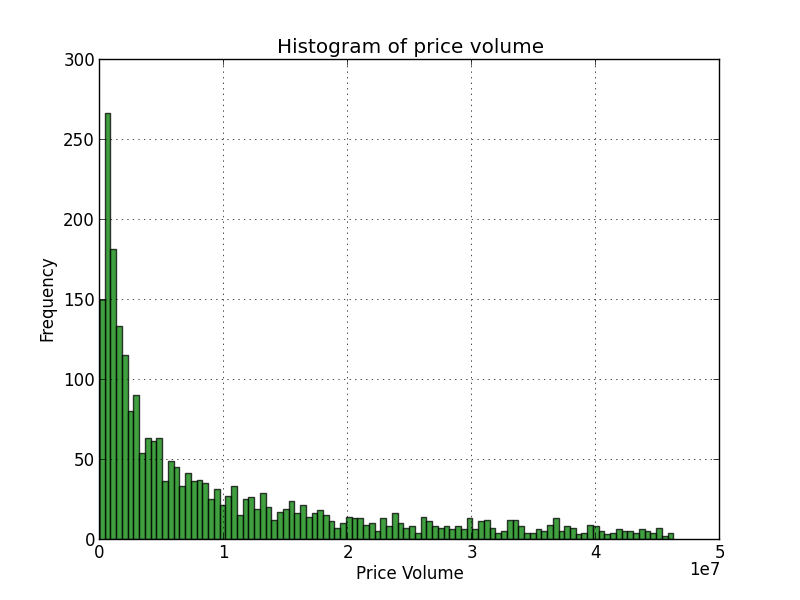 Average daily price * volume of stocks in the Russell 3000 as of July 2013. Horizontal axis ranges from $0.00 to $5B per day. Average daily price * volume of stocks in the Russell 3000 as of July 2013. Horizontal axis ranges from $0.00 to $50M per day. As you can see, a large portion of these stocks are trading below $10M per day (55%, or 1650 of them to be exact). A full 15% of the Russell 3000 trade less than $1M/day.